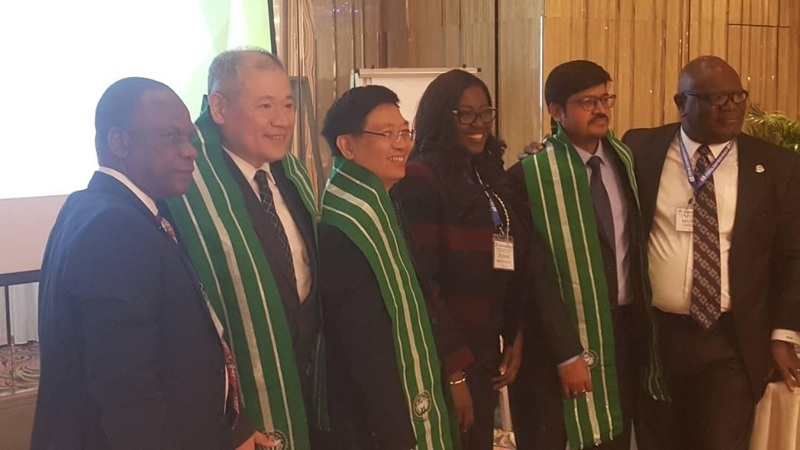 From left: Mr Richard Borokini, DG, Chartered Insurance Institute of Nigeria(CIIN) ; Mr Chu Heung Ming Stephen; Dr Wilson Cheung Jiag, Tai Insurance Brokers; Mrs Funmi Babington Ashaye, president/chairman of Council, CIIN; Dr Mayak Kumar Jha, chief operating officer, New India Assurance and Sir Mufutau Oyegunle, chairman Education Committee of the CIIN during International Exchange Conference of CIIN in Hong Kong. 1. Let me start by formally welcoming you all to Hong Kong, the great island-country that was governed by Britain for over 150 years which has now become a Chinese territory again. Looking at your faces, I have no doubt that you have fully recovered from the jet lag associated with long distance air travel such as this. I welcome you once again and hope that you will enjoy and actively participate in the various sessions we have lined up for you. 2. The choice of this location for our exchange programme was informed by a number of factors. Hong Kong is one of the greatest and biggest financial and trade hubs in Asia. It’s accomplishments in all spheres of human endeavour as islands clearly belie its small size. As one of the world’s leading knowledge centres, the achievements of Hong Kong in global commerce and international trade is at variance not only with its size but also provide a framework for learning and development. With the most efficient and busiest maritime container port in the world, it is on record that Hong Kong dispatches one container every 4 minutes to other parts of the globe. In 2017, its per capita income reached US$46,228.13 while its 2018 ranking on the global Ease of Doing Business is 5th! 3. Secondly, besides these performance statistics, it was estimated that services, which include insurance and reinsurance services, contributed 91% of its Gross Domestic Product in 2016.The implication of the dominance of the service sector cannot be lost on us: nations can develop without natural resources. The prosperity of this island is based on knowledge, its human capital. Therefore, there is a lot to learn from players in this environment so that we can positively impact our various organisations and by extension, our nation’s economy. Thus, our trip here is to learn, compare notes with our peers and also explore business opportunities particularly in the Insurance industry. 4. At the heart of this business exploration is the need to develop strategies for growing our businesses in an age of digital disruption. The Nigerian economy is blessed with a huge market of over 180 million people and a growing private sector-driven economy. In the drive to improve their efficiency and bottom line, many of the entities have embraced automation. As players in the highly regulated insurance service industry in which tariffs are fixed by regulations, our growth and competitive strategies cannot be driven by price differentials but by quality services. 5. What is the value proposition that we are offering to our clients whose businesses are disrupted by technology? How are we responding to their needs? Do we have the technical capacities to develop products that deliver online, real time value? Cyber terrorism has increased across the globe and now pose more risks to the value creating activities of entities that we insure. Do we have the financial and technical capacity to meet these emerging challenges? Can we leverage corporate alliances across borders to build this much desired capacity? Can we leverage specialization to set our various entities apart from competition? If an entity is reputed only for Marine Insurance or Oil and Gas, how does this enhance its position in the local and international market? 6. Thus, as we strive to evolve growth strategies whether through enhanced market penetration, product expansion, diversification or through mergers and acquisitions, what should be upper most in our minds are value addition and our capacity to respond to the needs of our most demanding client. We must give our clients what they want to retain their patronage over time. To be able to do this, corporate growth should manifest in the strengthening of areas where our entities were previously weak. The weakest link in our value chain should be the major beneficiary of strategies aimed at growing our entities. In other words, alliance across borders or mergers and acquisition should reinforce the capacity of the resultant entity to play a greater, more efficient role in the market. Competing on all fronts or in every sector may not provide the desired leverage. In fact, such a strategy may yield negative results due to dissipation of scarce resources. 7. In summary, as we strategically plan to grow our businesses, we must take our bearing from the market place. Users of our services must define what we do. We must connect with and respond promptly to their needs efficiently and effectively. Our business model must be in tune with clients’ demands and the realities of our environment. If we choose to diversify, it should be into areas of shared services which can reduce operational cost and enhance efficiency and profitability. 8. As I conclude these opening remarks, let me stress that the era of comparative advantage in business is over. The trend today is towards competitive advantage driven by investment in human capital. As Michael Porter noted, “the advancement of technology has given firms the capacity to reduce, nullify or circumvent many weaknesses in comparative advantages…”. Thus, organisations that desire to enjoy competitive advantage and in fact, dominate their market must invest in their people and infrastructure. Human capital, as an intangible asset, holds the ace to corporate prosperity and growth. As board chairmen, we often tell shareholders and the public that our greatest assets are our people. It is time to walk our talk by focusing on investments that will give us competitive advantage rather than comparative advantage. 9. Dear colleagues, my task this morning is to welcome you to this first executive session in which our professional colleague and an erudite lawyer has been invited to make a presentation and share his experiences with us. It is now my singular honour and privilege to invite Dr. Wilson Cheung to make his presentation. 10. Thank you for listening.